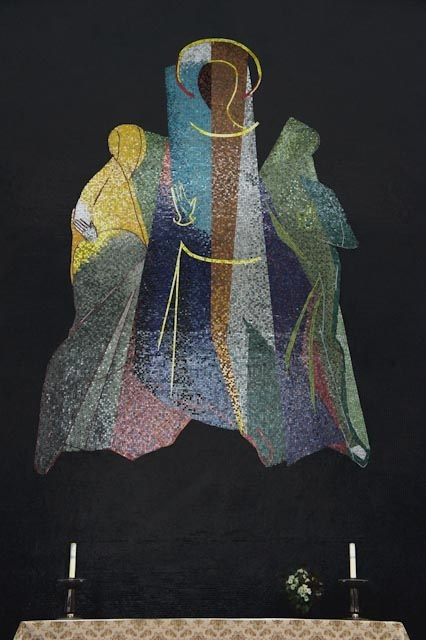 Although Piper’s study for this mosaic about the Risen Christ at Emmaus was inspired by Romanesque carvings and used his Neo-Romantic style, the finished work from 1959 uses his earlier abstract modernist style. The latter is altogether more in keeping with the modernist architecture of St. Paul’s Church which Humphrys and Hurst had designed for Harlow Town Centre. Piper undertook many church commissions and the most successful of these – including the Baptistry window at Coventry Cathedral, the lantern tower of Liverpool’s Metropolitan Cathedral and the high altar tapestry at Chichester Cathedral – are frequently abstract rather than Neo-Romantic. It seems that, while Piper found Neo-Romanticism an appropriate style for exploring themes of home and land, engaging with the Risen Christ and the Trinity called for a more abstract language. This work, a first experiment in mosaic, is not in a league with those ecclesiastical commissions which are among the highlights of Piper’s artworks. The issue with this work is that its interleaved stripes of rainbow coloured planes, clear colours set against the other which form the three figures of its design, are set against an 18 foot backdrop of black tesserae. The effect highlights the central image but also darkens the space overall. 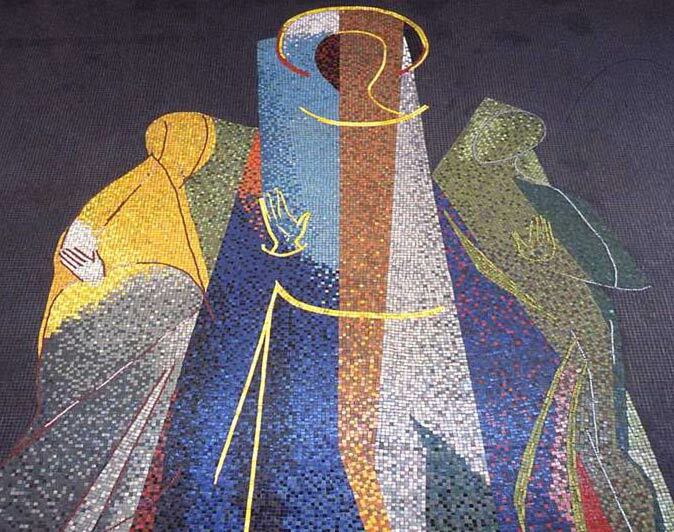 Piper’s next mosaic mural at BBC Television Centre was to have a dazzling all-over vibrancy of colour that contrastsmarkedly with the severity of the background to the Emmaus mosaic. The Emmaus theme of this mosaic was chosen to convey the sense of Christ being always present in this church and at worship, drawing people together in fellowship with himself. The triangular design of the central figures features the Risen Christ flanked by the two disciples who recognise him as he breaks bread in the house at Emmaus. Yet, for many viewing the mosaic, the abstract nature of Piper’s design means that this theme is not immediately apparent. It might be thought that this negates the sense of Christ’s presence which was fundamental to the commission. Yet a key aspect of the Emmaus story is, of course, that the Risen Christ is not recognised by the two disciples until he breaks bread, despite walking and talking with them for much of their journey to Emmaus. It is the abstract nature of the design that conveys this central element of the story. As a result the mosaic presents a significant challenge to those who view it. A challenge to recognise Christ in the unfamiliar – in those undefined coloured abstract planes – and a challenge to accept that the surrounding darkness, the darkness of death, is necessary in order to fully see the colour and light of the Risen Christ. John Piper, Risen Christ at Emmaus, 1961, 18 foot mosaic. Location: St. Paul's Church, Harlow, Essex, England. Second photo copyright to Martin Harris, Rector of St Paul's Harlow. John Piper (1903–1992) was an English painter, graphic artist, designer and writer. He had a long and diverse career but is particularly noted for his paintings of architectural views, especially of churches and stately homes. Piper gained recognition as an abstract artist in the early part of his career, but he soon became disillusioned with non-representational art. By the end of the 1930s he had reverted to naturalism. In 1940 he was appointed an official war artist and painted bomb-damaged building in London, Bristol, Coventry and Bath. He worked swiftly and often when the buildings were still on fire. After the war he was commissioned to design stained-glass windows for the new Coventry Cathedral. Jonathan Evens is an Anglican priest who is secretary to commission4mission, which aims to encourage the commissioning and placing of contemporary art in churches as a means of fundraising for charities and as a mission opportunity for the churches involved. For more information see http://www.commission4mission.org/. Jonathan's journalism and creative writing has appeared in a range of periodicals. His co-authored book The Secret Chord is an impassioned study of the role of music in cultural life, written through the prism of Christian belief (http://www.thesecretchord.co.uk/). Jonathan Evens will shortly be on a sabbatical during which he plans to visit significant sites connected to the renewal of religious art in Europe during the twentieth century. His intention is to reflect on the visits he makes in terms of the significance of these sites both for art history and good practice for commissioning, as well as capturing his personal and spiritual responses to the artworks at the sites. He plans to photograph each site and its artworks, write journal entries (for posting to his blog -http://joninbetween.blogspot.co.uk/) and articles for the ArtWay website about his visits. He will also write a final report summarising his responses and general conclusions in terms of art history, commissioning good practice and implications for prayer/spirituality.